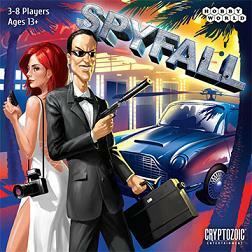 Spyfall is played over several rounds, and at the start of each round all players receive cards showing the same location - a casino, a traveling circus, a pirate ship, or even a space station - except that one player receives a card that says "Spy" instead of the location. Players then start asking each other questions - "Why are you dressed so strangely?" or "When was the last time we got a payday?" or anything else you can come up with - trying to guess who among them is the spy. The spy doesn`t know where he is, so he has to listen carefully. When it`s his time to answer, he`d better create a good story!